Flower heads bright yellow, several, ½–1″ across [12–25 mm]; no disk flowers; leaves alternate, 1–5″ long [3–12 cm], oblanceolate, 3–5 times longer than they are wide, entire; involucres, stems, and leaves (at least near edges) covered with long white hairs; leaf veins and stems often magenta in spring; stems milky-juiced, 10–24″ tall [25–60 cm]. 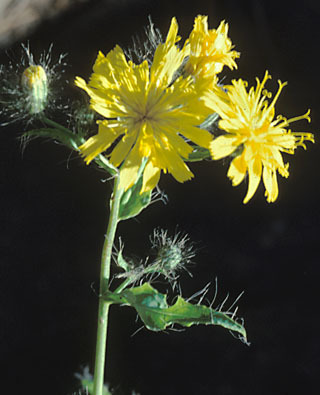 Similar: Scouler’s Hawkweed, with mid-stem leaves much smaller than the basal ones, is widespread in the Northwest, but not as common within the Columbia Gorge. Habitat: Rocky slopes at low elevations in the Columbia River Gorge. Natural History: The milky juice of hawkweeds and mountain-dandelions dries into “Indian bubble-gum,” which was chewed for mouth entertainment or cleaning.